Their menu notes that “menus are changed frequently….but the basic style and prices will remain”. That certainly appeared to be the case when I visited as the two dishes that I was torn between choosing were not listed on the paper menu that I took away after for reference. Those plates that caught my eye were the “Smoked Trout and Warm Potato Salad” for £7.75, and the dish which I chose the “Welsh Rarebit” for £7.50 or as described on the menu “Y Fenni ale & whole grain mustard Welsh Rarebit -2 slices of bloomer toast, grilled with topping & bacon, salad garnish”. Even before I arrived I had a good feeling that it was going to be a winning dish as I heard a couple of nearby tables order exactly the same thing. A lot of my non foodie friends just mock me when I say I cherish the joy of eating Welsh Rarebit, they try to tell me that it is just posh cheese on toast, I just shake my head and return to my moment of recipe hero worship. The Rarebit was made of Y Fenni cheese which is a Welsh variety consisting of Cheddar cheese blended with mustard seed and ale. The name comes from the Welsh name for Abergavenny. When I ordered it I had originally thought that they had mixed whole grain mustard and grated cheese together to make the topping. It was only when I did a little online research that I discovered that the cheese was made up of those ingredients. The best description I found was from the “International Cheese” website who describe it thus “Y Fenni cheese is a thing of wonder; moist and tangy with a nice bite of mustard seeds followed by a warm glow of real ale. The flavour is neither overpowering or underwhelming, but just right. Especially with a pint of beer on the side.” I kind of like that! 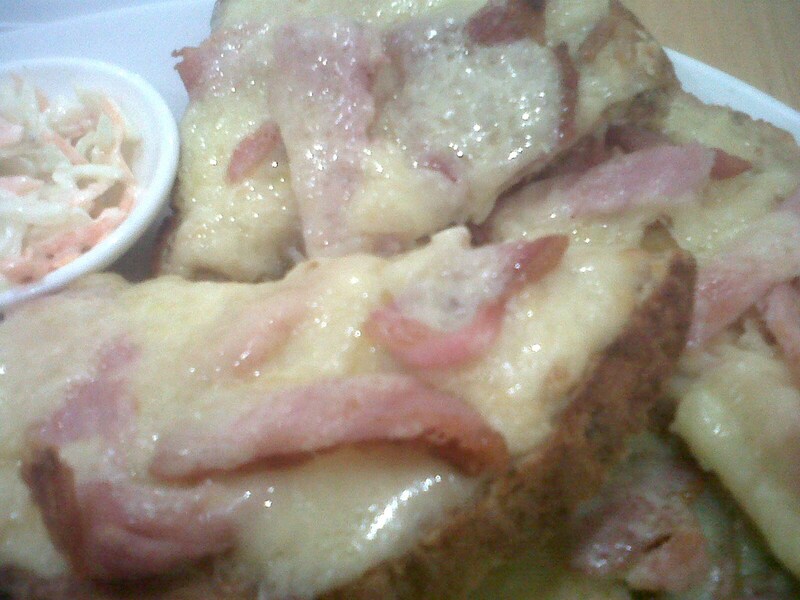 A close up of the Rarebit section of the dish just highlights how much cheese and bacon there was on each slice. It is not a great picture but it certainly tells you the story and I hope gives you a fair idea of how good this tasted. The slices were so large and had been cut into slices, so it felt as though I had four slices. It was looking like quite a substantial plateful and not really a light lunchtime snack. 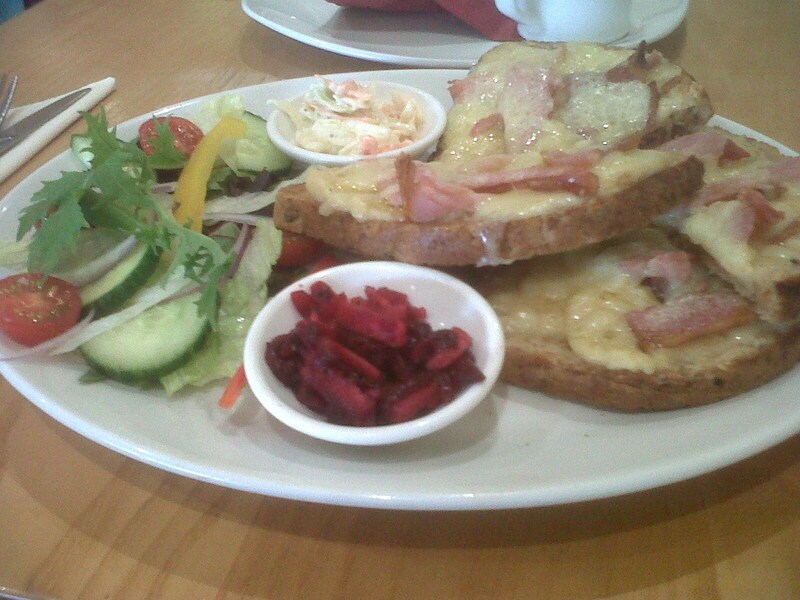 Apart from the rarebit on the plate, there was also a pretty decent selection of salad. I had almost the full tricolor of peppers with slices of red, yellow and green, there was red onion, cucumber, tomato, plus plenty of herb leafs. Added to that I had a couple of small pots of extra bits on there, one of coleslaw, and one of some sort of red slaw made up (I think) of apple and beet root. I did at least feel that I was eating a marginally healthy lunchtime snack (if I can forget that pile of toasted cheese). 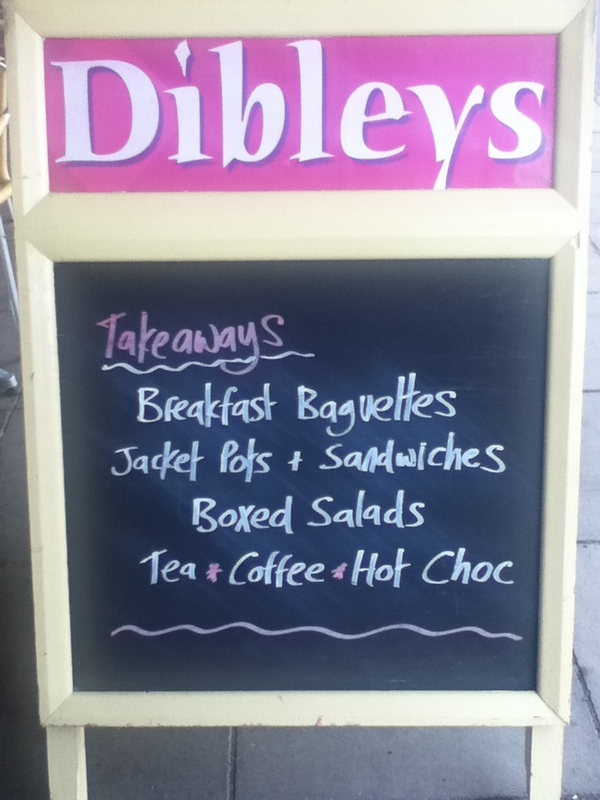 I quite liked the food offerings at Dibleys, there was enough variation on the board to suggest that it might be worth a return visit. It does feel a little bit old fashioned, but in a good way, I think that is what the diners want from their Dibleys. It certainly seemed to bit a bit of a meeting place for the local community so they must be doing plenty of things right here. In fact in there own words they say “We aim to create a fun place in the community where people can eat good food in friendly and pleasant surroundings.” and they even have their own “Friends of Dibleys” group. 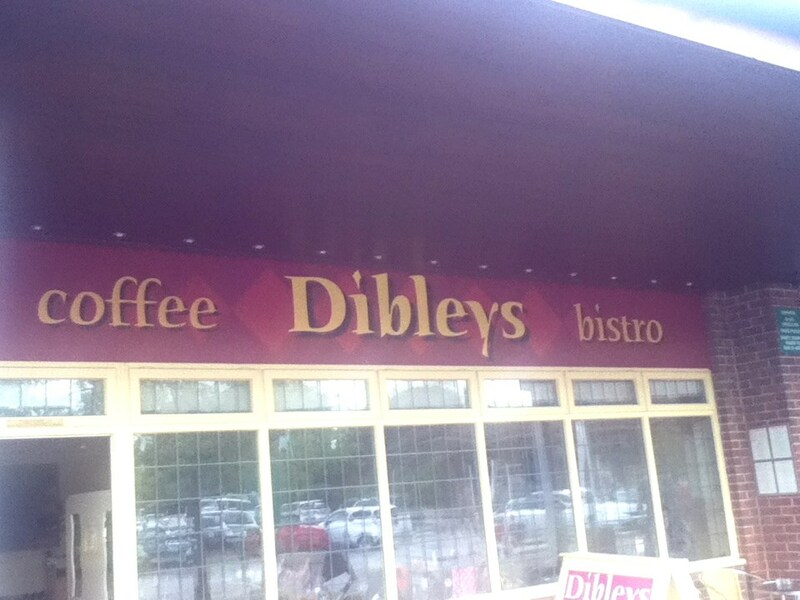 Dibleys is at 7 Compton Acres and to help you find it they provide pretty decent directions on their website.